Allegro information prior to World War II is scant and is mostly in the form of the bicylces that are still surviving today, (Special thanks to Peter Grenader for allowing use of information and photos he gathered about Allegro history). 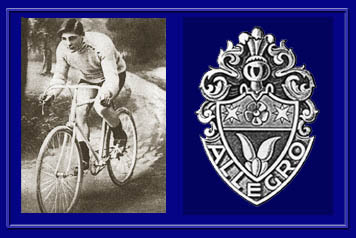 Founded in 1914 in Neuchatel (French Canton), Switzerland by Arnold Grandjean, Establissments Allegro gained a reputation for being one of the premier manufactures of racing bicycles in Switzerland. The Allegro story started at the turn of the 20th century when three brothers Ali, Jules and Arnold Grandjean- Perrenoud-Contesse, the sons of a clock and watch maker from the Sagne valley region of Switzerland started hanging around with a bunch of sportsmen. These friends being cyclists, the brothers quickly caught what the French call “Le Virus De La Petite Reine” (The virus of the ‘Small Queen’) or, in plain English, the bicycle bug and began competing themselves. Though they all saw success, it was Arnold who shined brightest. His palmares included the amatuer Swiss Championship in 1911 and 1912 for both road and cyclecross, 3 podium finishes at the Berne-Geneva race (3rd in 1911, 2nd in 1915 and a victory in 1916), 22nd in the 1916 Tour of Lombardy and 2nd in the 1916 Swiss professional national championship. He was a member of the Peugot team and competed in the Tour De France in 1911. By 1915 Arnold was world-ranked number 22 and the following year an impressive 4th. It was this passion for cycling which lead the brother’s Grandjean to open a small bicycle store in Fleurier, Switzerland which flourished. They were also active members of the Fleurisan bike club Beau-Site (Beautiful Site). It was in this shop where they built their first bicycle and in 1914 they officially coined the Allegro mark, whose famous emblem (the original version shown below) was designed by Couvet artist George Guye. It was soon after this that two younger brothers, Tell and Ulysses Grandjean joined them at the frameshop and in so doing, a legacy began. In 1923 Jules moved to Vallorbe where he opened his own sports store which sold bicycles and oddly enough, sewing machines. He later moved that business to Orbe, where he expanded it to include motorbikes. The four remaining brothers also relocated, moving to Neuchatel where Arnold, Tell and Ulysses built the first Allegro factory in 1923 which, along with bicycles, included motorcycles which they continued to produce until the beginning of the Second World War. Allegro’s involvement in racing was not limited to motorsports. They formed their own cycling team which by 1938 had earned a host of victores including two world championships, seven Tour De Suisse stage wins and the TDS overall victory in 1936. By the breakout of the war in 1939, the company celebrated it’s 25th year and Arnold, his 50th. Allegro had incorporated and was thriving, establishing itself as arguably the largest manufacturer of bicycles and motorcycles in Switzerland, touting an annual capacity of up to 20,000 bicycles alone. With a workforce of over 200 people they were among the largest industrial entities in the Canton of Neuchatel. They had over 500 selling agents, among them Jules’ son Daniel, who opened the first of three stores in Couvet which sold Allegro products exclusively (see photo). The war effort however had it’s negitive effects as well. Engine parts being scarce due to the ramp up of miltitary production in Europe, Allegro was forced to abandon its line of motorcycles indefinately. And despite increased popularity of their bikes throughout Europe, a wartime ban on exporting delayed company plans to distribute their products abroad which forced Grandjean to cut back his production. He simply could not sell 20,000 bikes a year in Switzerland alone. Below are two examples of pre- war Allegros that still have their original paint. The first example is a 1936 Allegro Champion Du Monde with much of its original components. It is most likely a Model # 7 with a Champion Du Monde Simplex (a one year only of manufacture, 1936) rear deraileur with a single Simplex (note the cable housing that extends from the shifter entirely to the deraileur) downtube shifter. This futher helps to identify the year of the frame manufacture. The forks of this time period sported a full chrome fork with lite detail of paint and lug lining in the fork crown. Pin stripping and lug lining were hallmarks of the Swiss during this time period and on into the late 1960’s. 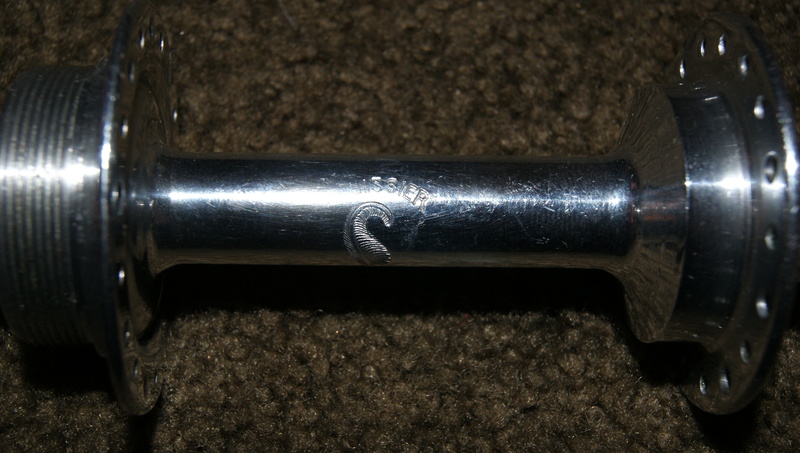 Reynolds 531 tubing was the choice of the factory from at least the 1930’s and onward. The Lugs are made by ……. and are the model…….. The bottom bracket is a George Fisher stamped on the underside +GF+. The + stands for the Swiss flag and is of swiss manufacture. 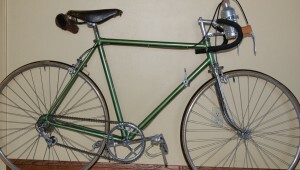 This Allegro came with a 1930’s Brooks B17 Key Hole saddle (often called this due to the key hole stamp cutouts on the top of the saddle) that featured black rails and saddle bag loops for a tool bag. 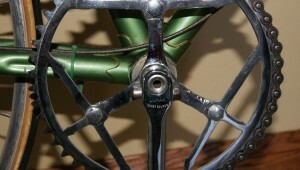 A steel closed dome chrome top “candle” seat post was typical of this era and used into the late 1950’s. Being of Swiss manufacure, Allegro used Swiss manufactures such as Duralaca rims and Weinmann Brakes and rims. Other components favored by Allegro were often of French manufacture due to their proximity to the French border. The crank is a French Durax Super Course crank set with nicely fluted 170mm arms that came with a 49 tooth (note the “Arrow” style supports of the chain ring) chain ring. 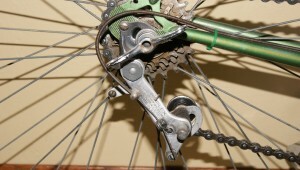 The drive side arm with 3 attachment arms for attaching the chain ring is of one cast piece. Other original components from the 1930’s era were the aluminum Pelissier Modele Plume hubset. Plume means feather, referring to their lightness. 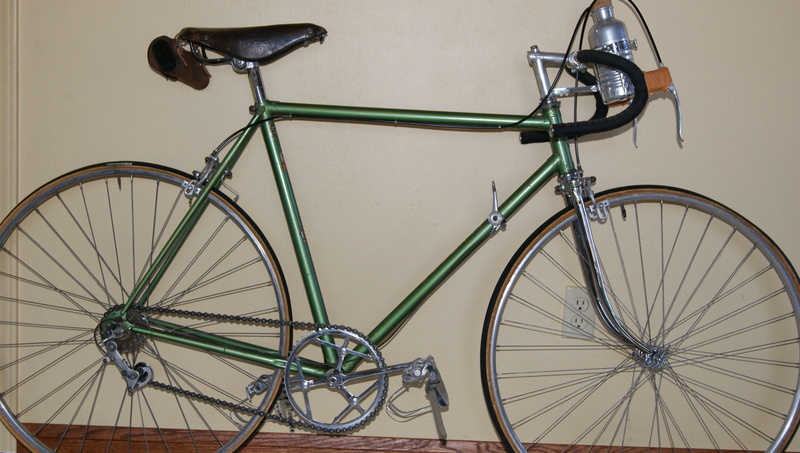 Typically the racing bikes had aluminum components where possible while city or sport bikes had more of the steel components to reduce costs.